Yes, it’s time to tip the cap of wonderment to the brain behind the adaptivity and creativeness at Northcore. For those of you who need a bit of a catch-up on the boss of Northcore, please check out a previous article here. For those who can’t be arsed to do that, here is a quick recap. Matt, the founder of Northcore first invented the ‘Keypod’. You know, the lockable combination safe that clips onto the exterior of any automobile thus storing your keys in a dry, safe place leaving you free to enjoy your surf. That was a long time ago. The operation has grown, things have changed, the team has grown, their reach is far beyond our shores and the products are numerous… and with good reason. One thing that has not changed and remains core to er… Northcore is the continuing quest to invent and adapt in the name of making the average surfer’s life easier. I am here today to review the newest grey matter secretion from the Northcore collective mind. Surf Straps, a surfboard carrying solution. There is no getting away from the beginings of Northcore. The all to well used Keypod. In this world of pollution, plastic and nasty gasses, one does one’s best to reduce one’s carbon footprint. As we have eluded to before on Surf Bunker, the action of driving to your local surf break massively outweighs any kind of eco board you might buy. It’s a huge carbon footprint issue. Northcore then, knowing this have teamed up with an International group of surfers calling themselves Salty Beast. 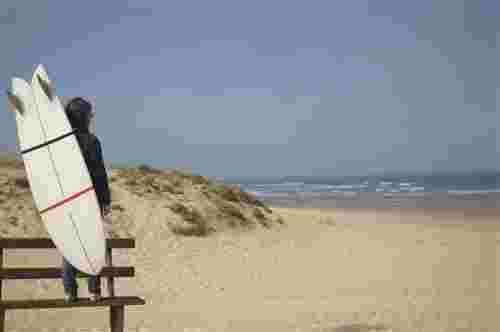 They have turned their creative minds to the problem, to design a little something to make getting your board to the beach easier without using a vehicle powered by exploding fossil fuels. The polution of the ocean and air is getting worse. It's a fact. The adaptive Surf Straps from Northcore/Salty Beast collaboration are designed to give the surfer every option of getting their board to the beach, either walking, cycling or skating. They are designed to be a simple, elegant and compact solution for carrying all types of surfboards. As with a lot of Northcore products, the guys are always looking to improve their product and take advice from the real surfing world with serious gusto bringing out new and improved models, nothing is perfect until it is. We love this about them. So, there have been other straps, carrying methods, what makes these different and worthy of your attention? A simple adjustment in the design which makes it all easier. I will explain. The conventional surf strap. It works but what Northcore & Salty Beast have done is think outside the box. With most other strap solutions we have seen the board is either carried in a sling, which goes over your shoulder putting you off-balance and in the long run (or walk), is not good for those all important vertebrae. Other solutions (like this one) consist of your board being strapped to your back either via a back-pack or just some straps which seems simpler. The problem with these designs in reality is that your heels and calves would hit the board if you took long strides (not really that practical). This also means that cycling (due to the back wheel grinding off the nose of your board) or skating would be a no-no. What’s different about the Northcore/Salty Beast Surf Straps? A very clever and probably difficult to achieve piece of engineering means that the very adjustable straps that hold your board on your back vertically can be angled. The result is that the nose of your board situated slightly to the side allowing your feet and ankles to do their thing whilst walking. This is also true when cycling, you shouldn’t have to worry about contact with the back wheel. Simple, in theory, right? Time to put it to the test then. And here they are, the adaptive straps from Northcore and Salty Beast. In what must be a Northcore ‘thing’ the straps come bundled in a handy mesh bag perfect for travelling. The size is about half that of a shoe box. Upon first inspection there did not no appear to be any instructions and, de bagging the straps, I could not see any obvious way to set them out, just a mixture of straps of different colours. Then I noticed two diagrams on the back of the packet, and within minutes what I thought was going to be difficult turned out to be so simple and easy. Once you get your head around how they do what they do, it’s easy. Who ever designed the instructions did a very good job, and with the upper and lower straps having different functions and colours this was a nice touch. The whole thing was very light-weight and minimal. I wondered if they would be up to the job. No room to carry anything in a backpack, worth noting, while it might seem obvious to those with a brain. Ashamedly, I live about a 4km drive to my nearest wave, the way is through fields and dense shrub by bike so testing this product was going to require some thought. The best way was to drive (yuck, I know) to a town that had a 2km bike path the the beach, cycle and walk (two different trips) to the beach, surf and then back to the car. Walking – For the first walking test I decided to use my ‘go-to’ 5’11 fish, it’s a bit wider at the nose in a true ‘fish’ template. I good test I thought. I followed the instructions, getting some strange looks from normal (non surfing) people and found the whole process of attaching the board to the straps surprisingly easy and quick. Board on my back I went to sling my bag on my… hang on. Where was I going to put my rack sack, clearly I didn’t think this through. I ended up carrying my wetsuit, towel, leash around my neck. Not the most comfortable. Super simple to set up and the straps are light-weight and store away in a small pouch. The board on my back was super comfortable but the excess gear around my neck did not sit well. When I got to the beach, the straps came off and packed away easily. A surf was had and the walk back to my car was much the same but now I had a wet wetsuit around my neck. I would need to think of another way to carry my gear as the normal back-space was taken up. If you don’t need to surf with a wetsuit this would not have been a problem. Cycling – This time I thought about it and used the same board but with a pushbike that had a basket on the front so I had a place to store my gear. I made sure the straps were tilted at the maximum angle and off we went. The whole thing went without a hitch, got to the beach, had a surf and started cycling back, the wind was off shore and I was now cycling against the wind with a big sail on my back (board) which made it really hard going. To give the straps some credit, they worked keeping the board away from the back tyre even with the gusts of oncoming wind. Cycling is do-able with a smaller fish, shortboard etc. I can’t help thinking if I had a bigger board and the wind was stronger this might have been an issue. Bigger surfboard – let it not be said that we don’t go that extra mile here at Surf Bunker in testing. I thought I would try a new Skunkworks foamie 8ft that we had in testing. These boards are very wide and thick, the straps fitted fine though and back to walking I found I could put one foot in front of the other just fine. About halfway through my walk to the beach the wind changed and came onshore, I had a huge sail and found the board moving around a lot, like someone was wobbling it around. Being eight foot, it was sticking up in the air a fair amount and I felt a bit top heavy. Doable but not that comfortable. Still I have to admit, the straps held and did not feel like they were going to break. The Adjustable side tilt option worked pretty well. I did notice that under the extra weight I had a small rubbing scratch on my back where the straps had began to rub on my skin. Further testing – Not 100% convinced that I had got the whole picture with the straps, I decided to lend the straps to a friend who walked to the beach everyday. She tried a lot of different boards and said that up to 7ft the straps acted normally even with wind, over that they became uncomfortable. The attention to detail and build quality as you might expect from Northcore was great. It was simple, small and light. Came with a travel bag to keep the straps from getting tangled up with the rest of your equipment. Did exactly what it said on the tin and worked up to 7 foot boards with no hassles. Cycling with the straps on worked fine with the smaller board. Colour coding of the different straps that have different functions made the straps easier to use. The indents and padding in the strap make tightening it easy and you don't have to worry about squashing your board. With a heavier board, I found that there was some rubbing on the skin where the carrying straps met the higher strap. Not an issue with the smaller boards though. Not having the space carry anything on my back. Not a fault of the straps but something that needs to be considered. The all important price. The straps come in at a cool 22 Euros, which we think is probably about right. A lot of thought has gone into making these things as minimal and functional as possible. If you want a solution for getting your board to the beach while not carrying it under your arm, these things are super comfy. If you are lucky enough to live in a place you either don’t have to carry a wettie, or are going to wear you wettie on the walk then again, it works. Other than that you need to have another plan on how to carry the other bits you need for a slide. The size of board you have is important to think about as we found anything over 7ft was really a no-no with wind, and just being in control of your movements, e.g. not being blown over on the walk. We do love the innovative approach and offering a solution to a particular problem. Getting to the beach without your car does effect the final score. Editors Note: In the interest of going above and beyond with extreme testing, I got out one of my favourite logs (surfboard) which is 9’4, 24.5, 3.38 and built like a tank, Volan glass and heavier than a baby hippo. I wanted to see if I could use the straps for this monster, I took the fin out and slid the board into the straps, made sure I was surrounded by soft stuff and slung the board and straps on my back. At 22 euro these are not going to break the bank, come in super hand if you want to get to the beach under your own steam. The feeling was like trying to balance a totem pole on my nose, teetering this way and that until finally I ended up on my back on the sand. But. The straps held. A big tick, and tip of the cap to the strength of these things.